Baking is comfort. The process of measuring flour, sugar, cocoa is mediative. I take joy in watching the puffs of white and dark dance in the air with each sift and stir then slowly drifting down onto the countertops dusting everything in a fine powder. The music made as the stainless steal measuring cups that live together on a big metal ring hit each other as I move from one size to the next followed by the clang, clang, clang as they settle on the countertop when they are no longer needed is a tune I've heard since my youth. 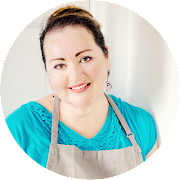 A direct connection to my childhood, my love of baking, like I suppose many girls of my generation, started with my first little red Easy-Bake oven. 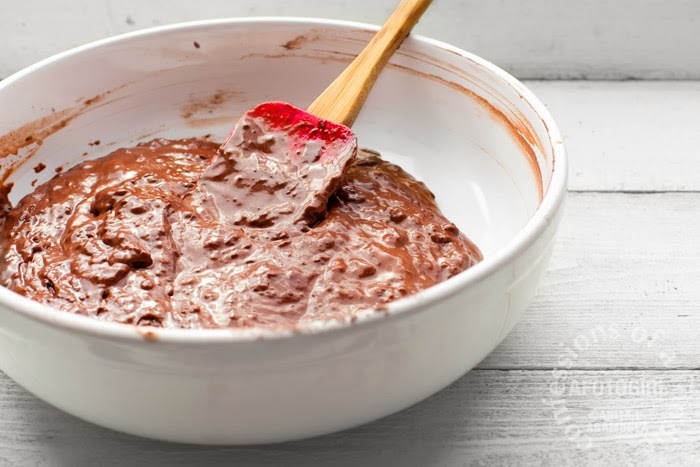 I remember the joy of ripping open those tiny foil packets, mixing my batter, pouring it into the cake pans that made cakes no bigger than an average-sized pancake and licking the excess frosting from my fingers after preparing it in anticipation of my cakes being ready. Oh! I can only imagine now how horrible those little cakes must have been yet my mom and dad would praise my creations as they happily tasted them all. I also still have my first cookbook. It was a Betty Crocker kids baking book given to me by my Tio and Aunt Margaret. It's tattered pages are smudged with butter and chocolate and the cover held on by a big rubber band. It sits amongst my other less used cookbooks reminding me of summer days spent in the kitchen with my best friend as we picked out recipes to tackle that day. I also remember weekends supervising my sisters as they tackled their own baking firsts. It is no surprise that all of us girls grew up to enjoy the process of creating baked treats to share with friends and family. I love doughnuts. I mean, who doesn't like fried dough? But I always feel so guilty eating them with all their fried calories. So I bought myself two doughnut pans and thought, how bad can baked doughnuts really be? Well, not bad at all. 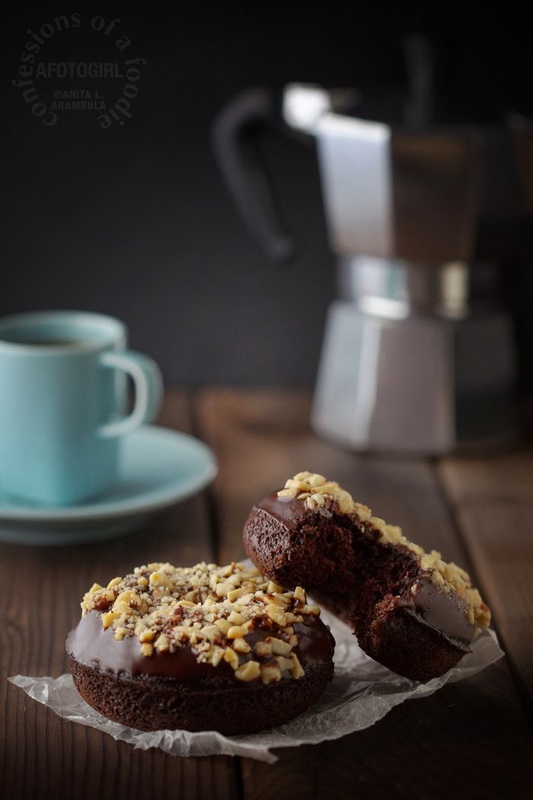 They aren't the same dense baked doughnuts from the bakery, granted, but these homemade variety are quick (no yeast needing to rise) and they're tasty little treats often made from items already in the pantry. 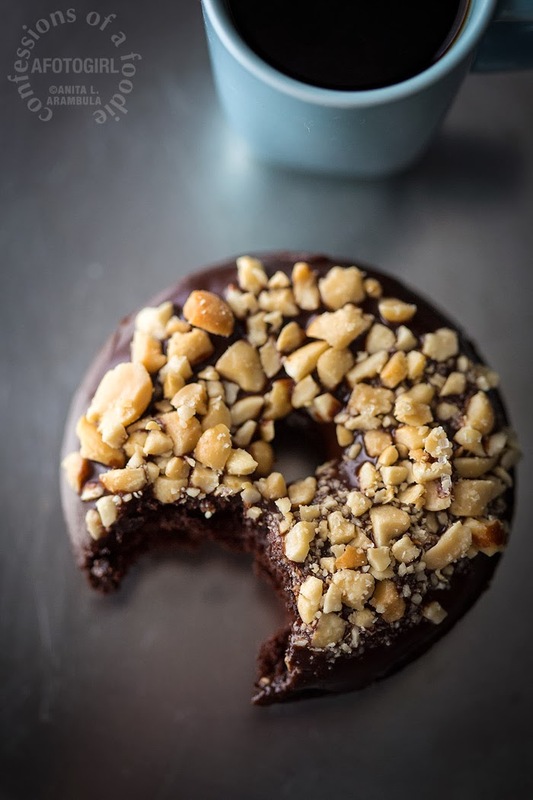 These little guys are a little less guilt inducing and they're cute and round, with a tiny hole in them and pretty jimmies or salty nuts on top and they make a great pairing with a good strong cuppa joe for breakfast. Have I convinced you yet to give these a try? It took several trials to get this recipe to where I was satisfied. The first was too dense and a bit dry. The second was moist enough but the experiment of a Kahlua glaze wasn't satisfying not to mention that it remained sticky never producing that crusty crunch I wanted from a clear glaze. Some had Dutch process cocoa; some natural. One batch had sour cream; one a little vinegar. 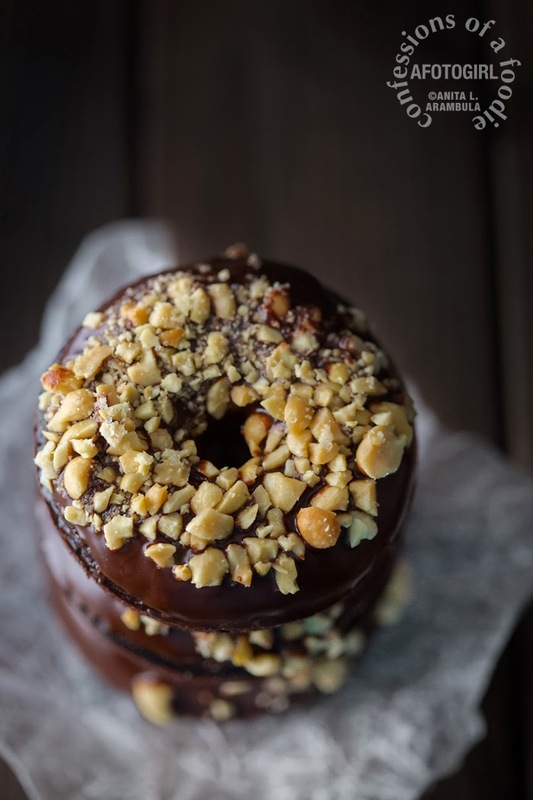 I landed on this recipe and like the balance between chocolatey flavor, moistness, density and the satisfying chocolate glaze that set up enough to allow the doughnuts to be stacked without ruining the glaze surface. 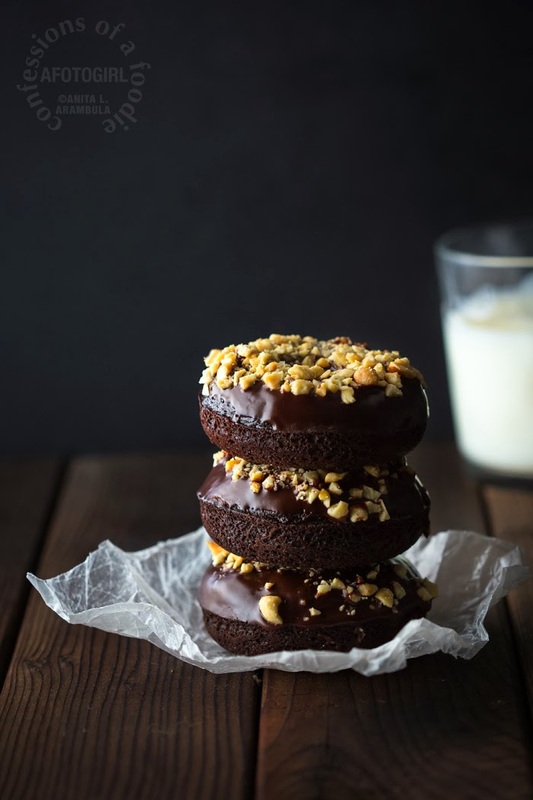 You could make this a triple chocolate doughnut by adding mini chocolate chips, if you desire. Again, I've used King Arthur flour and European-style butter but you can substitute whatever you have in your pantry. 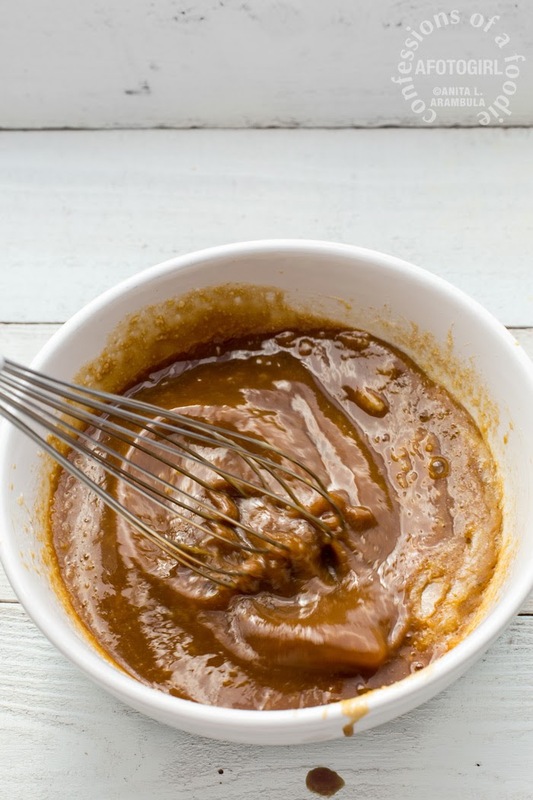 I also used dark brown sugar because I like how that deeper molasses flavor compliments chocolate but you can use light brown if that's what you have on hand. A quick word about salt: I primarily use sea or kosher salt because I prefer the taste. If you use regular iodized table salt, remember to decrease by half. Preheat oven to 325 degrees Fahrenheit. 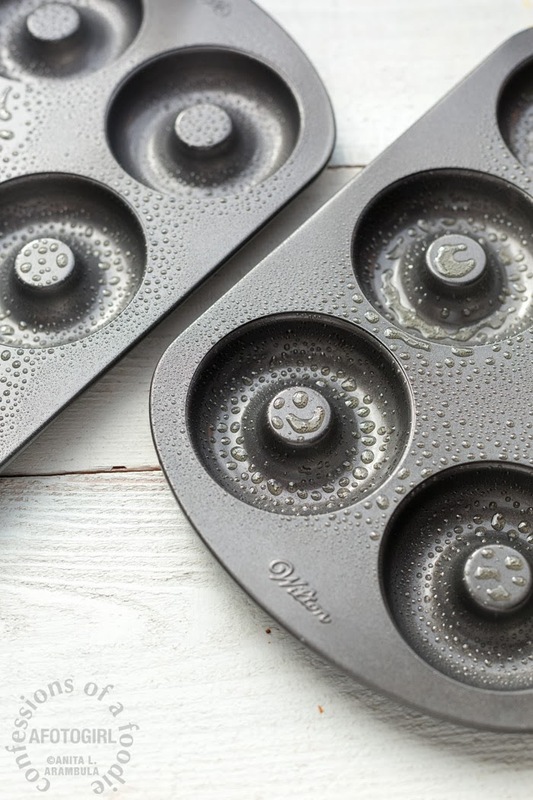 Spray pans with cooking spray; set aside. Sift the flour, cocoa and baking soda over a large bowl. Whisk in the salt and set aside. 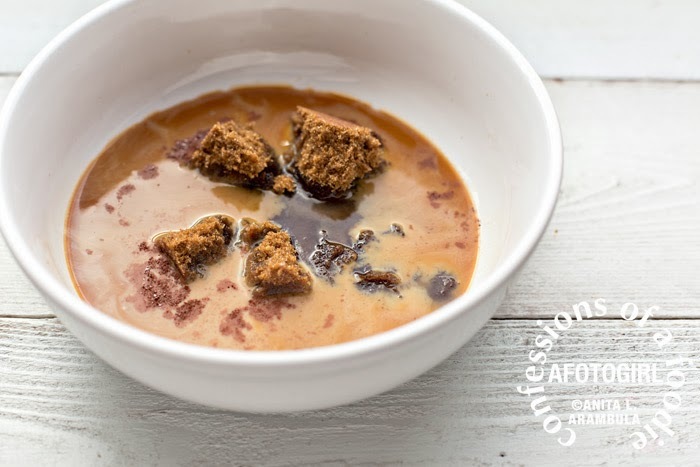 Beat the milk,espresso, sugar, egg, cooled butter, and vanilla in medium bowl until combined well. Mix the wet ingredients into the dry ingredients until incorporated. Prepare a piping bag by placing it in a tall glass and rolling the top over on itself a half inch down or so. 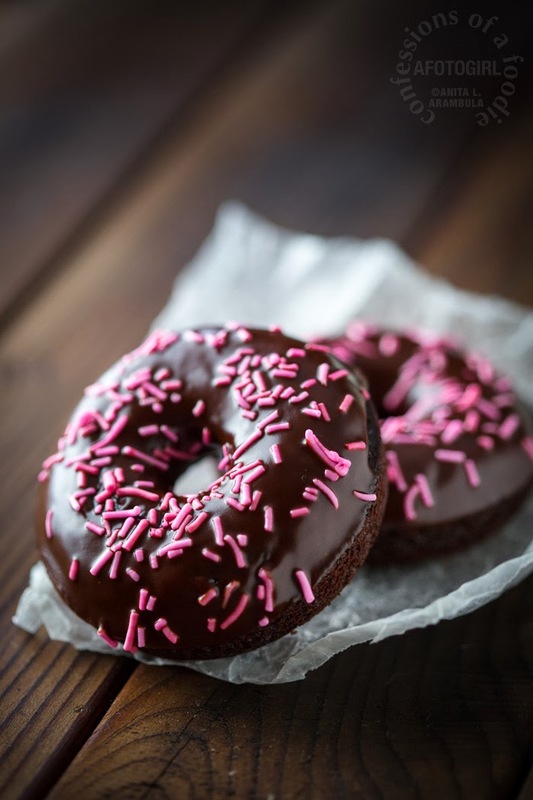 Carefully add half the batter to the bag, unroll the top, twist, snip the tip of the bag and pipe into the doughnut pan filling the pan ⅔ of the way (or a ¼ inch from the top edge of the cavity). 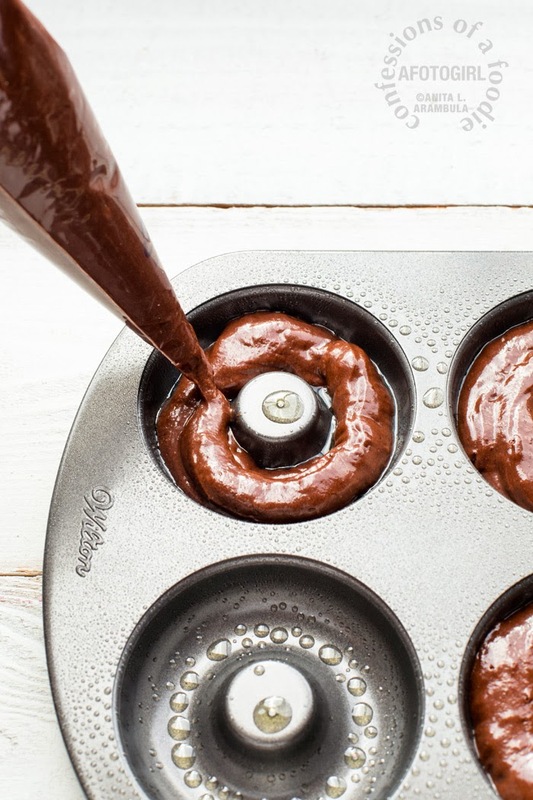 If you overfill, the batter will rise too high and fill over the hole. Repeat with remaining batter. If you have only one pan, allow pan to cool slightly before filling it. 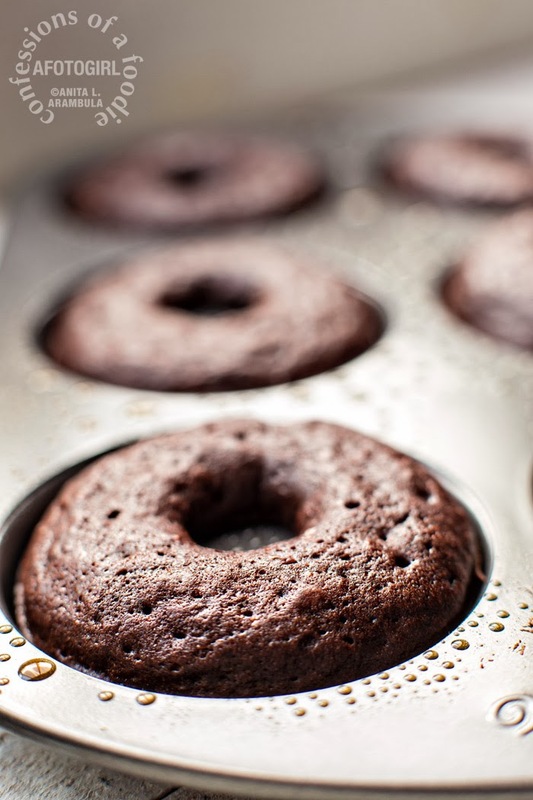 Bake doughnuts on the middle rack for 7-9 minutes or until the doughnut springs back when gently touched. Remove from oven and place on cooling rack to cool in pan for 5 minutes. Then carefully flip over onto rack and allow to cool completely before glazing. 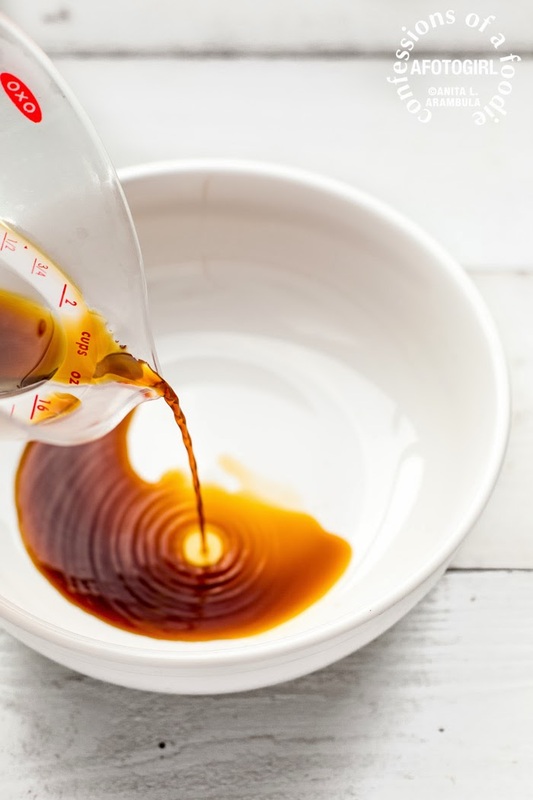 To make the glaze, place a small saucepan with about 2 inches of water on high heat and bring to a boil then reduce heat to keep water at a good simmer. Place the chocolate chips, butter, syrup and vanilla in a stainless steel or glass bowl and place over the simmering pot making sure that the bottom of the bowl doesn't touch the water. Stir continuously with a rubber spatula until almost completely melted. Remove from heat, continuing to stir until all the chocolate has melted and the chocolate is smooth and glossy. Place your garnishes on small plates. Carefully dip a doughnut into the glaze then immediately place the doughnut onto one of the garnish dishes glaze side down, pressing gently. Return doughnut to cooling rack to allow glaze to set. Repeat with remaining doughnuts. 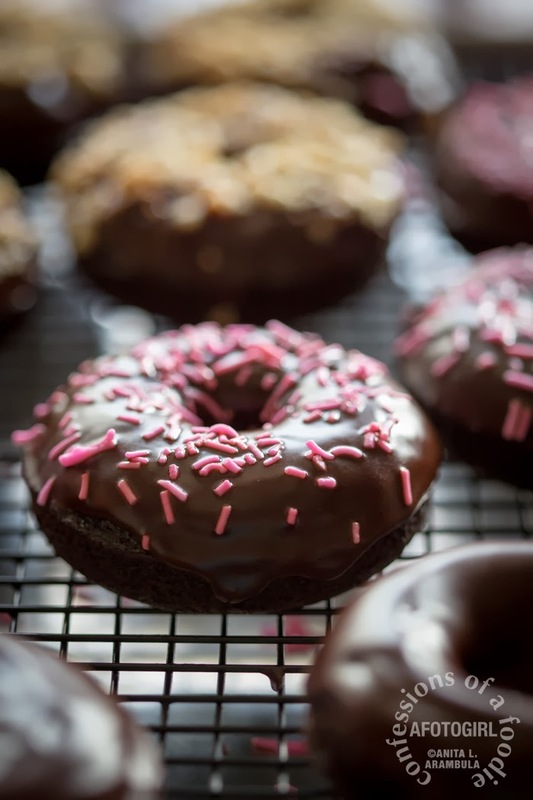 For a lighter touch with the garnishes, alternately, dip the doughnut into the glaze, return to the rack and immediately sprinkle doughnut with desired toppings or leave plain. 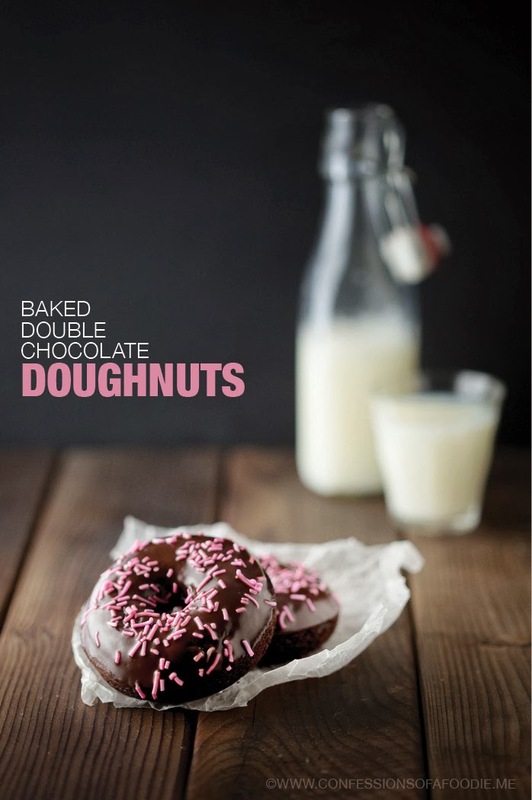 Doughnuts will keep 2-3 days in an airtight container at room temperature in a cool spot in the kitchen or dining room. I always like seeing how other photographers work so periodically, I spend some time here either showing you a behind-the-scenes photo or sharing a photography tip or two. Today, I share with you a behind-the-scene photo of this shoot. 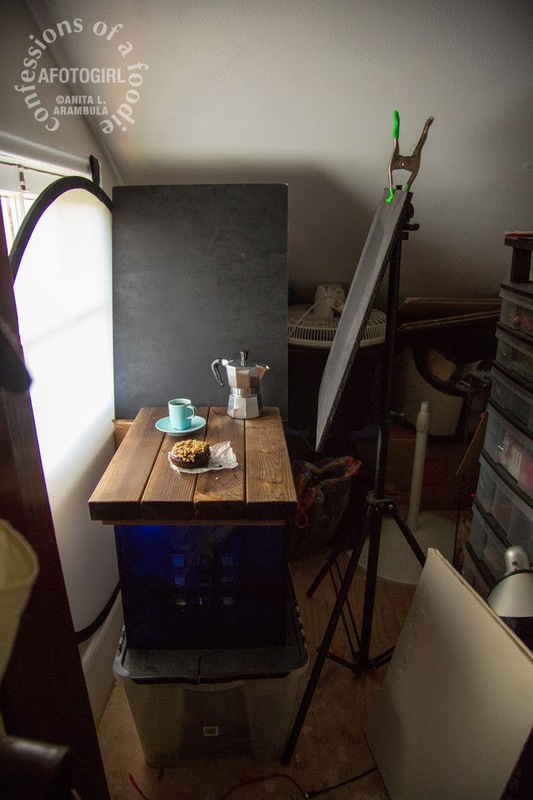 With the winter light disappearing so early in the afternoon and being flanked on one side by a two-story house and on the other by trees and my grandmother's tall flowering shrubs, it's often hard to find the right light when I need it for the finished food shoots. Of course I have studio lights buried deep behind boxes in this very closet that I am showing you but I don't have much space to set them up properly. Besides which, I really do prefer to keep my food photography as natural and editorial looking as possible and nothing does that better than natural daylight. Even vibrant props look better in daylight. So it was nearing 3 p.m. on a generally overcast day that had me changing my white balance from 4800k to 6800k (I almost always shoot on K or custom and only use auto white balance when I'm shooting quickly as in photographing children or events) to make up for the peak-a-boo sun and occasional passing dark rain cloud. All the process photos where taken in front of the kitchen window earlier in the day. Now, that window was in shade. As I went from room to room looking for a spot to take the finished photos, I wound up in my bedroom which is a second story room generally filled with light except for this day. Giving in to the prospect of having to set up my studio lights, I opened my closet and was bathed in beautiful light. 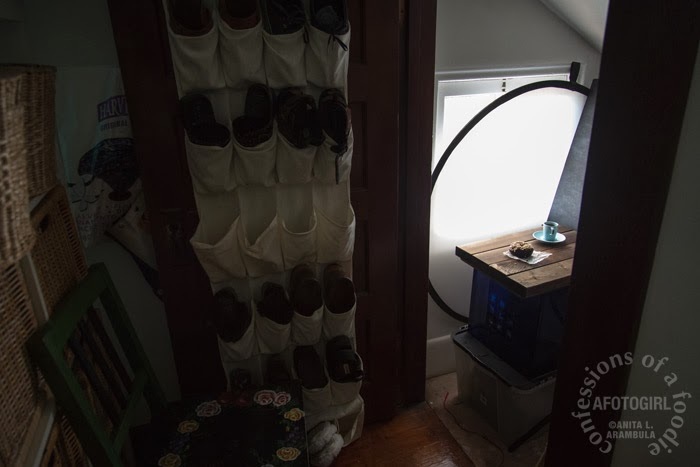 The little 2'x2' window in the closet was unobstructed and a good amount of soft light was streaming through it. I set up there and made the final photos with the most beautiful light I'd had all day. The lesson here: you never know where you might find great light so make a note of where the light hits at different times of day throughout your home so when it comes time to shoot, you aren't wasting precious time chasing down light. Even a small, cramped space is sometimes all you need to make a good photo. Until next time … Happy Valentine's Day! Ani! Love the pink w brown and the double chocolate. The fact that these are baked just means I don't have to feel guilty, right? Love that you shared your "studio." Beauties! They look scrumptious. Thanks for sharing the behind-the-scenes photos. Looking forward to meeting you at Camp Blogaway! Those look incredible. Chocolate... mmmm! I am pretty sure those are the prettiest doughnuts I've ever seen! I also love seeing the set up of your photo shoot! Yummy! You can't go wrong with double chocolate. Mmmmm, chocolate. I love that you used a pastry bag to fill the molds. Novel idea! And, as always, your photos are just lovely. Thanks for showing the setup! It's great to see your process. I love your lighting hints! Unfortunately I don't think I have much to work with at my home but I usually don't post recipes either. I may take a second look now though just in case. There's gotta be light somewhere!